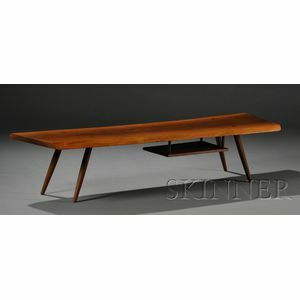 Free beveled edge rectangular form with center grained and tapered legs fitted with a shelf on underside suspended by dowels, one dowel missing and loss on one leg, ht. 14 1/4, wd. 20 3/8, lg. 66 1/4 in. Provenance: From the gentlewoman who commissioned the work.